New Photos go up often with our latest in cake designs. Visit the galleries for all the newest looks! Click Here for Full Gallery! 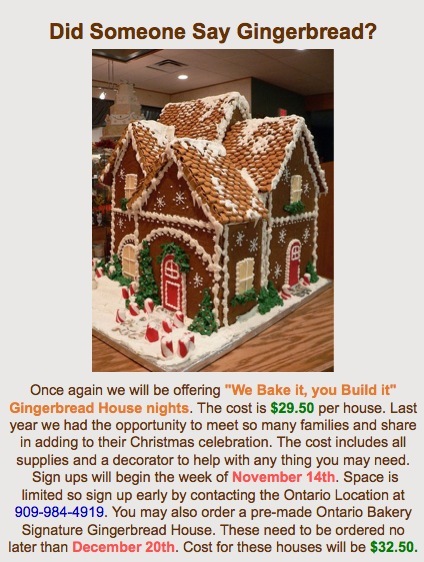 Sign ups are still being taken for our "We Bake it You Build it Gingerbread house nights. The cost is $29.95 and includes everything you need to make a beautiful Christmas memory. Each group can be up to 4 people creating one house. The sessions are held at our Ontario location. Call 909-984-4919 to get your reservation in. 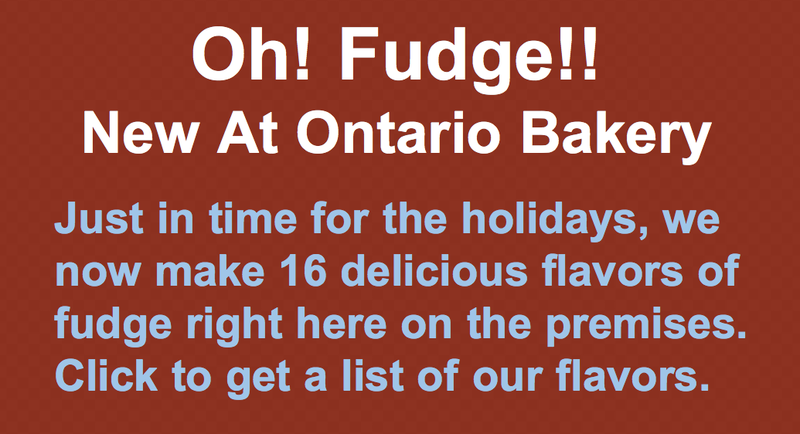 You can also purchase an Ontario Bakery Signature House for $34.00, order early. It's that time of year again, a time for getting together with family and friends. 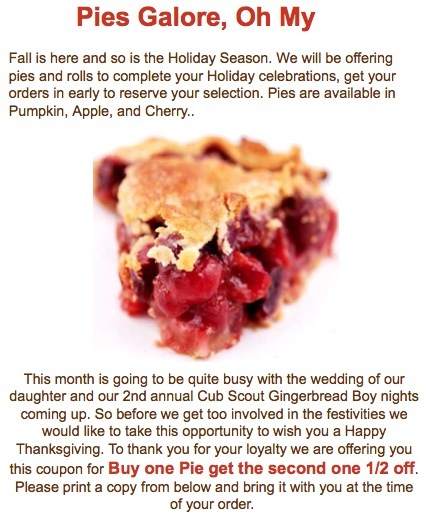 We have many special Holiday Treats in our stores. 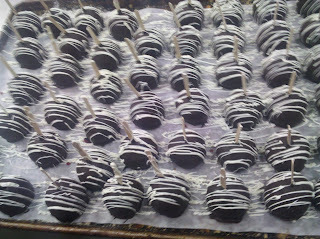 Cookie trays, holiday breads, cake pops, pies, rolls, fruit cake and so much more. During the month of December you can enter to win a Gingerbread House each time you visit either location. We will be drawing the name of a lucky winner on December 23rd at each store. September has crept up on us and Labor Day is only days away. As our daughters wedding draws near there is still so much to be done. The small things, the last minute details, the finishing touches. All of the things that can easily be overlooked. So much time goes into the planning of a wedding. That magical day that you want to be just perfect. The day that the bride has dreamed about since she was a little girl. Picking that perfect location and the flowers and all of the finishing touches that make for an unforgettable affair. We know that there are many of you out there right now who are in the same planning stages of your wedding. 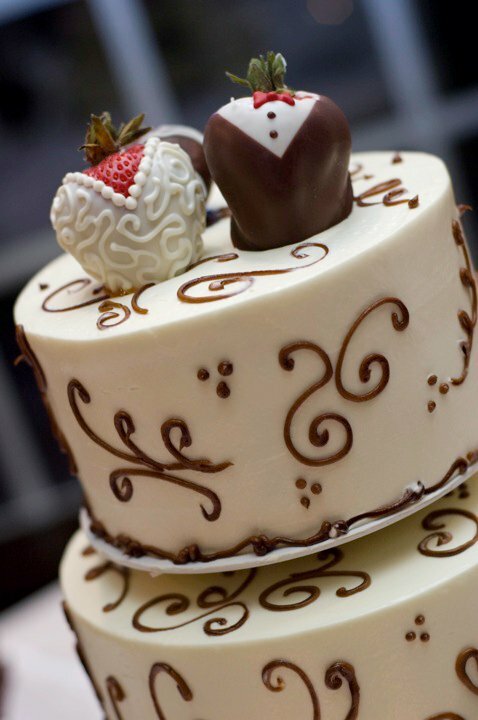 The cake is an important show-piece at your reception, and all of us here at Ontario Bakery want to provide you with the best tasting and most reasonably priced cake that is a showcase piece at your reception. Knowing that she can have any design for her cake that she wants has only hindered our daughter in making a decision. When coming in to chose a cake , bring pictures of what designs suit your taste. We love having a visual of what it is you in- vision as your perfect wedding cake. Together we can work to find the perfect cake for your event that falls with in your budget. We here at Ontario Bakery have 29 years of experience in designing wedding cakes. We look forward to meeting with you and hope that we can help to make that special day one that you will not soon forget. Owner Chris Fabos answers questions about wedding cakes. First up, do we provide sample tastings? Yes! Ontario Bakery is family owned & operated, serving all of the Inland Empire with two locations in Ontario and Rancho Cucamonga. We create amazing creative cakes for all occasions. Owner Chris Fabos answers questions about wedding cakes. Here he answers the burning question: Do I need an appointment? Yes! Owner Chris Fabos answers questions about wedding cakes. You've got questions about wedding cakes? Here's a "Top Tier" answer! 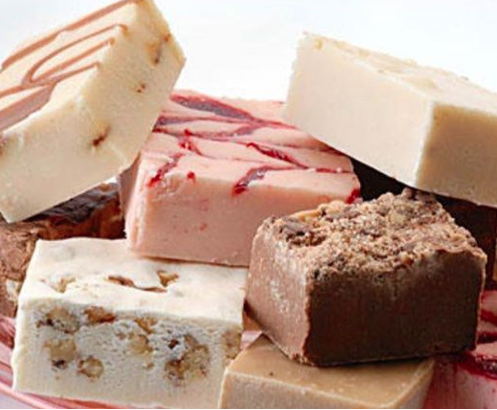 Ontario Bakery is family owned & operated, serving all of the Inland Empire with two locations in Ontario and Rancho Cucamonga. We create amazing creative cakes for all occasions. Owner Chris Fabos answers questions about wedding cakes. Let your imagination soar! If it can be made out of wedding cake, we can design it! Ontario Bakery is family owned & operated, serving all of the Inland Empire with two locations in Ontario and Rancho Cucamonga. We create amazing creative cakes for all occasions. See hundreds of pictures on our website. Owner Chris Fabos answers questions about wedding cakes. 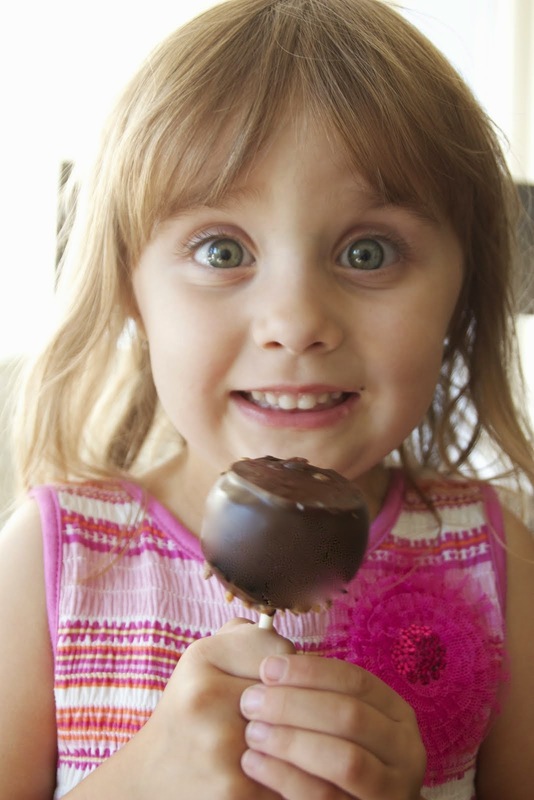 Are there rental items we'll have to return to the bakery after we've eaten all the cake? Sure, but it's no big deal. And you can take care of it after your honeymoon if you want. Ontario Bakery is family owned & operated, serving all of the Inland Empire with two locations in Ontario and Rancho Cucamonga. We create amazing creative cakes for all occasions. Ontario Bakery: Lifetime Television Presents.....: "Our Rancho Cucamonga Location was a buzz today with Camera Crews and Television Producers. We spent about two hours filming for a new show c..."
Our Rancho Cucamonga Location was a buzz today with Camera Crews and Television Producers. We spent about two hours filming for a new show called "Altercations". This will be the first episode aired of this Lifetime Channel Production. Thanks to the Bride and her Mother-in Law. You are wonderful people and we wish Allison and Jason the best for their wedding day. To those of you who came by during filming we are sorry for any inconvenience this may have caused you. We will keep you posted as to the air date. 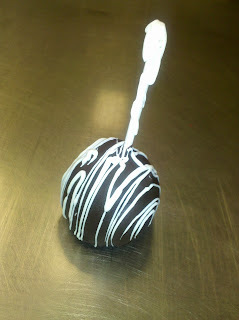 Make sure to stop by either of our locations to find our Cake Pops. 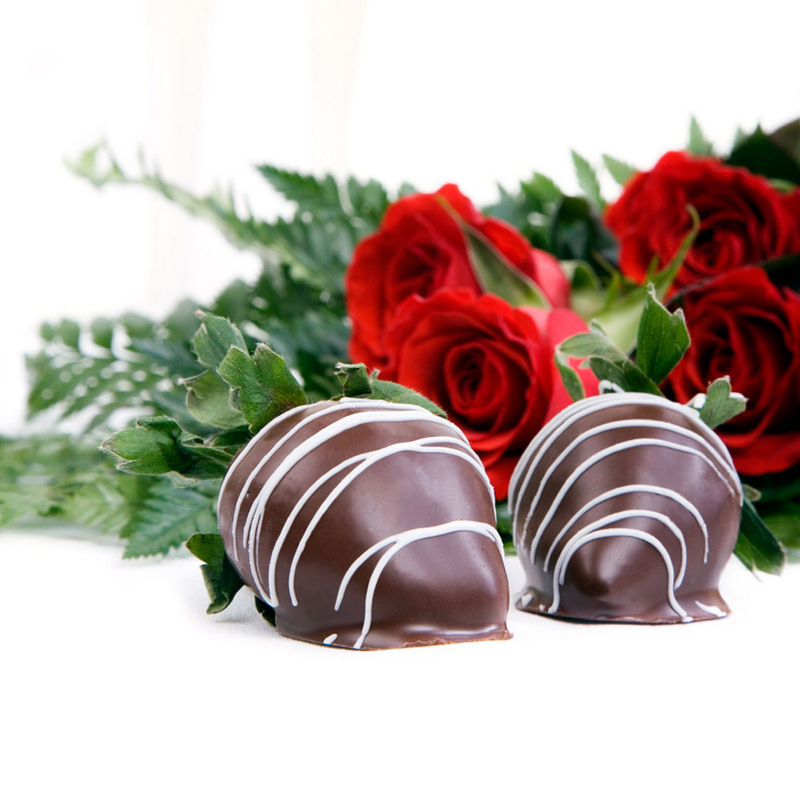 Also don't forget that Valentines Day isn't far away, a box of our fresh Chocolate covered strawberry's make a wonderful gift for that special someone! Are you in Love? Is there a special someone who would love a chocolatey delight? 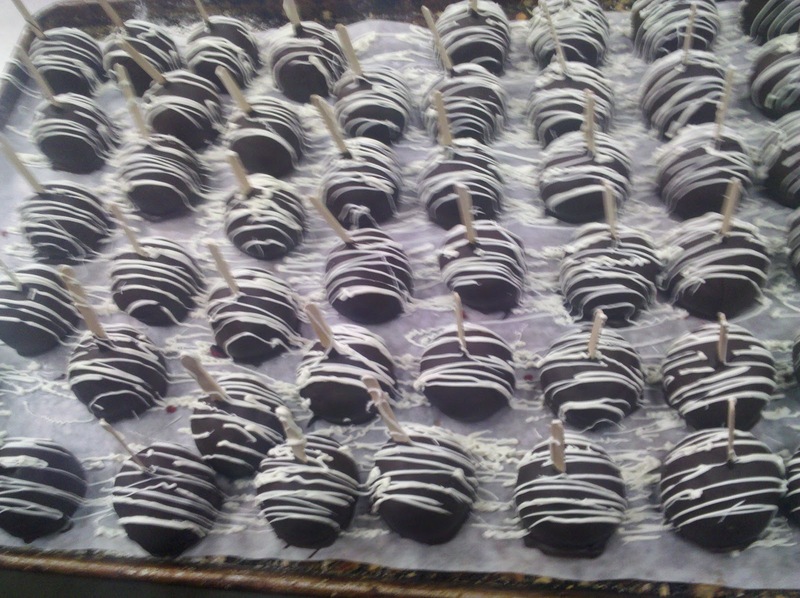 We have Chocolate dipped Strawberries, Chocolate Dipped Cheesecake Slices, Brownie Pops, Red Velvet Cupcakes, and so much more. 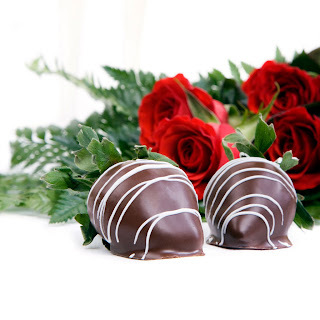 There's nothing quite like a fine bottle of wine and delicious chocolates to make a romantic evening complete. So surprise that special someone with a unique chocolate treat that goes beyond that box of chocolates. Sorry everyone for the lack of posts the past few weeks. The holidays were a busy time for us! Thousands of cookies, countless number of rolls and breads not to mention all of our Gingerbread events. This month of January we will be getting everything ready for the new year. Within this year a lot of things are changing, by the end of next week we plan to have all new decorations on our in-store display cakes. Also at some point were planning on a slight change of the inside decorations of our Ontario location. But this month of january we will be having a FREE cup cake give away day so make sure u stop by and pick up a free cup cake. I will be posting more about it when we have finalized the day.